I am a student doula currently studying with my doula, Chloe French of Delmarva Birth Services, and Childbirth International (CBI). After the birth of my own children, I felt the calling and desire to help women in my own area achieve the birth experience they seek. Pregnancy, birthing and parenting is truly a magical and empowering time in a womans life and I feel blessed to be able to share in that experience. I live in Harrington and serve women all over Delaware and nearby areas in Maryland. If you are searching for a doula, please feel free to e-mail me with any questions or concerns you may have! Don't let travel or finances get in the way of having the birth you deserve. I married my best friend in April 2009. Since then, we've had two children. 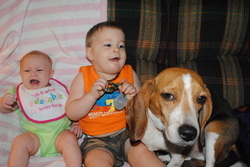 Our son was born in 2010 and our daughter in 2011. Although both were natural births, they were completely different. I have breastfed both and we donate extra milk through HM4HB. We are all active in our local church, breastfeeding & babywearing community. Along with my current doula training, I earned a diploma for American Sign Language studies in 2004 and am working towards an Associates Degree in Communications, both from Delaware Tech. Read our son's birth story here. Read our daughter's birth story here.